AHRM Inc. is a full service Contract Research Organization (CRO) with a focus in Health Outcomes and Health Economics Research. By providing the ability to integrate both clinical and economic research into one protocol or study, AHRM Inc. can support FDA, Health Authority and Payor requirements typically in the same study protocol during the health technology development period for pharmaceuticals and medical devices. For pharmaceuticals or devices already approved, Applied Healthcare Research Management Inc. can provide extensive guidance and support to develop, implement and manage trials in North America and Europe, or leverage existing data to develop and publish economic models targeted at payors or to support reimbursement. 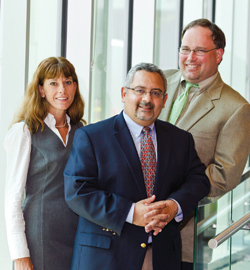 Located at the New York State Center of Excellence in Bioinformatics & Life Sciences (COE) building since 2008, Applied Healthcare Research Management Inc. has built a positive reputation with clients based on performance, professionalism and cost efficient execution of both Clinical Trial and Outcomes Research engagements. AHRM Inc. has conducted both clinical and outcomes research across most major therapeutic categories in North America, Europe and Latin America.